It’s great to have a nice yard and garden, isn’t it? It makes your home and property so much more attractive. On the other hand, you do need to maintain your yard properly, and often that means you need to find the best weed wacker to do the job for you. Gas-powered, corded electric, or battery-powered. The kind of weed wacker you get is the first major choice you need to make. Each one has its own set of pros and cons, and so you need to make sure that your choice matches your circumstances. How well does the weed wacker do the job it’s supposed to do? With this factor, the gas-powered models are your best option, because they offer powerful motors that can provide high rpm that can deal with any type of vegetation you use it on. Also, you have to consider the swath diameter, as a bigger one will obviously get the job done faster. You should also check if it can work as an edger too, or if you need to buy attachments to make this switch. This is about how well you can handle the weed wacker so you can do the job comfortably. It helps if you can adjust the length of the handle, and of course it’s also easier for you if it isn’t too heavy. For heavier models, you may need to check if it comes with a shoulder harness, which can add support and control. It also shouldn’t vibrate too much. Ease-of-use features. This factor includes how easy it is to start up, which is crucial for notoriously hard-starting gas-powered weed wackers. You’ll want to check how easy it is to put in oil and water, or if the batteries can last long enough for you to get the job done. You also need to check the spool type and see if it advances the line automatically, and if it’s easy to replace the spool. For an item like this, it is really highly recommended that you stick with well-known brands. That’s so you don’t waste time and money dealing with substandard quality. Famous brands have spent years establishing their reputation, and you’re better off by picking a famous brand than some unknown manufacturer. This isn’t brand snobbery—it’s just plain common sense. 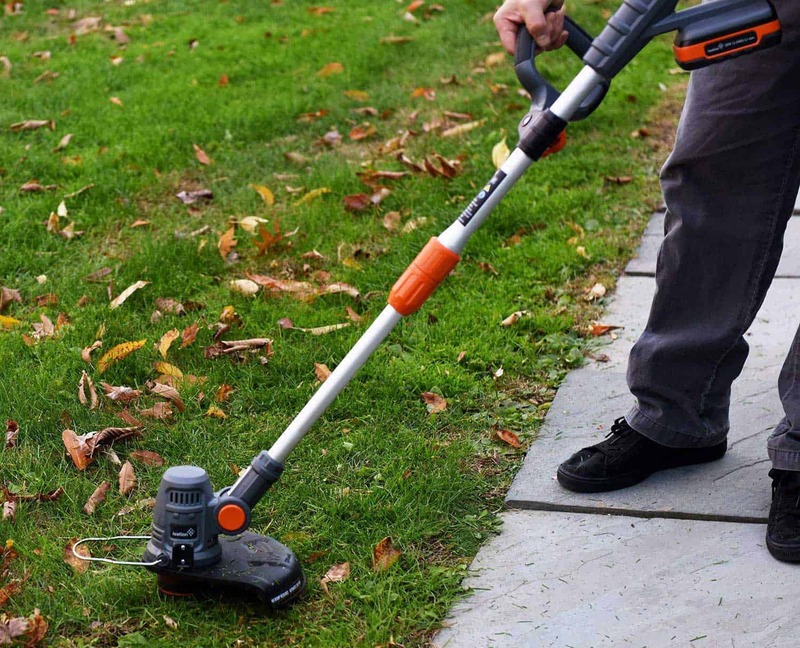 This is a battery-operated trimmer that can convert to an edger in just a few seconds. So right away you know that you don’t need to deal with fumes and fuel mixes, and you won’t have to bother with cumbersome cords. This uses the 2.0 Amp hour lithium ion battery pack. The motor can go up to 6200 rpm. It features an automatic feed spool. The height and handle positions can be adjusted. The cutting swath is 12 inches. It also offers a guard on the head so that you and your pretty flowers are protected. It converts to an edger easily. The battery is an improvement on the previous version. It also uses the same type of battery that you find in other cordless Black and Decker power tools. You can charge those other batteries fully so that you’ll have an endless supply of portable power if you have a large yard to maintain. It’s more comfortable to use since the height and the handle can be adjusted. This makes storage a lot easier as well. The light weight not only makes it comfy to use, but you’re able to control it much better. 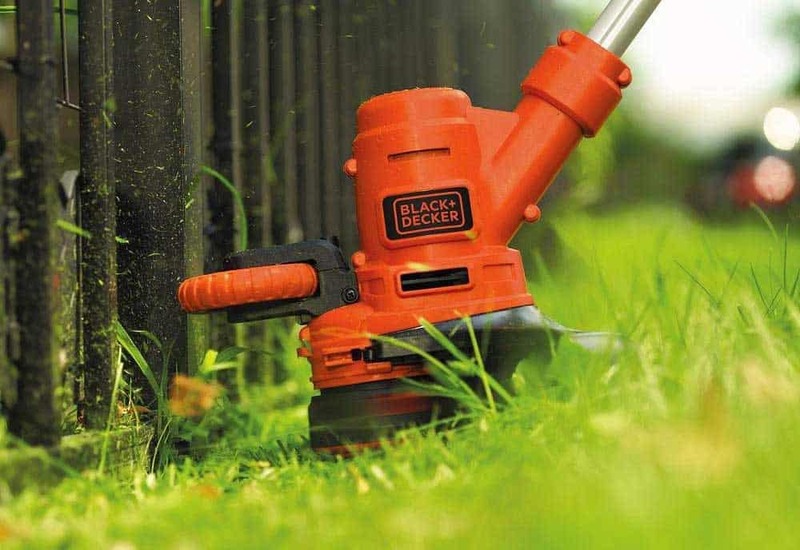 You do have ample power to trim grass and weeds with no trouble. Changing to the edger function doesn’t take more than a few seconds. The single battery can last for just 25 minutes or so. That’s a problem if you have a large yard and you don’t have spare batteries because you don’t have any other Black and Decker cordless power tools. This means you’ll have to buy a spare battery pack for backup. Like most battery-powered trimmers, the power may not suffice for more stubborn stalks and vines. Other types of stubborn weeds may also take several minutes, compared to the few moments needed with a gas-powered weed eater. You may want to change the installed string with an edged version for better cutting performance. 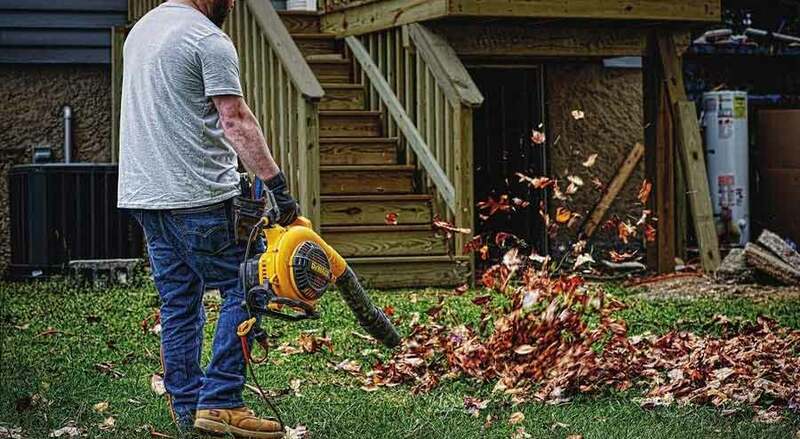 This works well enough if you have a small yard to maintain, and it makes perfect sense if you’re also a frequent buyer of other Black and Decker cordless power tools. Just get an edge string to improve the cutting ability, and you can really enjoy the comparative quiet and the fresh air. Once again we have a trimmer that turns into an edger easily, and it’s powered by a rechargeable 20V battery pack. Again you can enjoy not having to deal with a long cord, nor do you have to put in gas and oil, or contend with a lot of noise, and noxious fumes. This uses a Max lithium power battery, but this purchase comes with 2 of them. What’s more, this is the battery that’s used for the 20V Worx Power Share System. This means that if you have other cordless Worx power tools in your shed, you can use those batteries for this trimmer. Again you have a 12-inch wide cutting swath. Converting the trimmer to an edger only needs a simple pull so you can turn the trimmer head. Once that’s done, you can just turn it to lock it securely. Now you have a wheeled edger for sidewalks and driveways. You have 7 preset height settings to choose from. With these presets, the handle clicks into place so it stays that way as you use it. As for the weight, it’s just 5.3 pounds. There’s no bumping here needed to advance the line, as it uses the “Command Feed” spool system. With 2 batteries you have a backup power supply available so you can work longer without waiting to recharge the batteries. You also get lots more batteries to use if you have lots of other cordless Worx tools. The battery runs for 20 to 30 minutes, so 2 batteries can give you up to an hour of trimming. It’s nice that it turns into an edger very easily. With the preset height settings, you’re able to pick one that lets you control the trimmer most effectively and comfortably. It also helps with control and comfort that it’s so lightweight. It takes about 3 hours to fully recharge the battery. So, even having two batteries, won’t allow you to use one while charging the other one indefinitely. The cutting ability obviously won’t deal with tougher stalks and vines. This is like the Black and Decker cordless in most ways, though here at least you have an extra battery as part of the purchase. However, this really makes a lot more sense if you already have other cordless Worx tools at home. Tired of taking too long to trim your large yard? Do you have tough stalks to deal with that the battery-powered models can’t handle? If that’s the case, then this is what you need to get. This is a gas-powered trimmer that can get up to 11,000 rpm with 8,000 rpm for the output shaft. The fuel ratio is 50:1, though you don’t have to bother with mixing gas and oil yourself. That’s because Husqvarna also sells premixed fuel for this. The cutting swath is 17 inches wide. It uses 2 strings to cut with the T25 Professional Tap Advance trimmer head. The weight measures in at 11 pounds. This weight doesn’t include the weight of the fuel. The operating noise can reach 114 dB, so yes, it’s loud. The 11-pound weight is actually light compared to some other gas-powered models. This comes with various Smart Start features to help minimize the start-up To make it easier to start, it removes the air from the fuel system and the carburetor. The stop switch also automatically resets to the on position. You don’t have the mess of mixing oil and gasoline, as you can buy the premixed fuel instead. The cutting power of this is exceptional. It can handle just about any vine you want to deal with. The 17-inch cutting swath also makes the work faster. It doesn’t vibrate all that much. It also comes with a semi-auto spool feeding feature. While you can replace the trimmer line yourself, you can also just buy replacement T25 trimmer heads which already have the trimmer line installed. You can remove the trimmer head and replace it with other attachments, such as an edger. Storing this doesn’t have to be complicated as the shaft is detachable. Obviously you’ll have to accept all the disadvantages of gas-powered trimmers, such as weight, fuel requirements, fumes, and noise. This is so noisy that you really need ear protection. 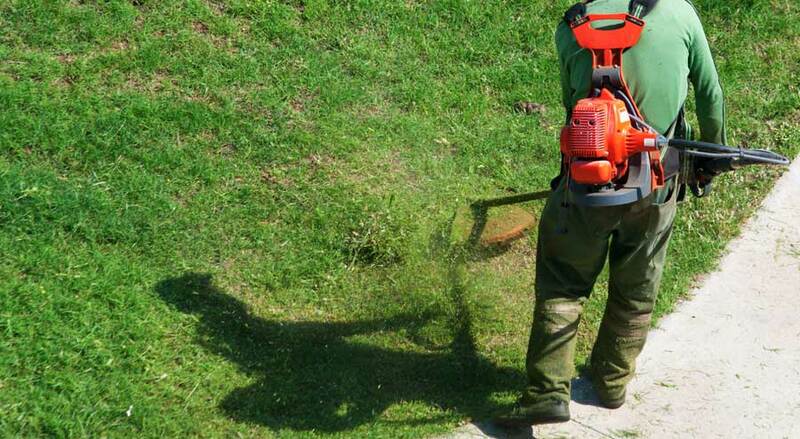 The drawbacks seem minor when you consider that this can handle any type of vegetation you want to cut. This is professional-grade quality with consumer-grade ease of use. 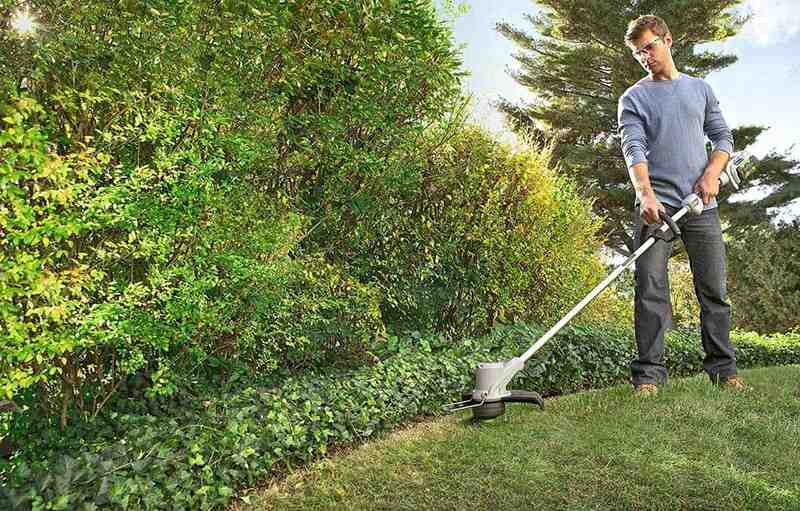 Compared to other gas-powered trimmers, this can do more, yet it’s not more complicated. If you have a large yard with problematic vines, then just get this one. This is another cordless weed wacker, but in many ways it’s different from the others on this list. 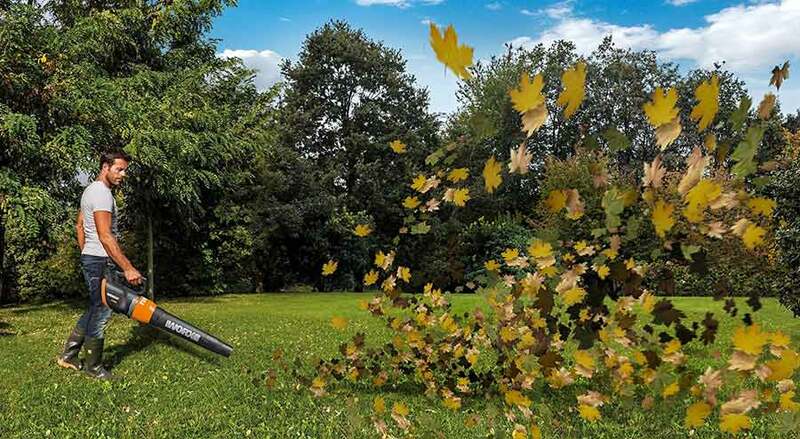 Many prefer this because of its more advanced features, and it’s probably a much better option if you want a cordless trimmer for a large yard. This comes with a 20V MAX 5.0Ah Lithium Ion Battery along with the charger. The cutting swath diameter is 13 inches. This offers high and low-speed setting options. The low setting gives you 4600 rpm and a longer battery life, while the high setting reaches up to 6000 rpm. This uses the traditional bump feed method. With the more powerful battery, you can use this for large yards of up to 5,000 square feet without having to run out of battery juice. You also enjoy a slightly wider cutting swath. 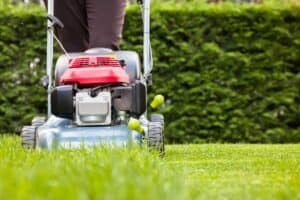 It also helps that you can pick a high or low-speed If the grass is easy to trim, then the low setting can offer up to 2 hours of continuous usage. The bum feed type is actually preferred by some people, because many automatic feed designs can be wasteful. It’s actually not that heavy. It comes with a 90-day money back guarantee, 1 year of free service, and a 3-year warranty. Some people can use this for edging, but it’s not really designed as a trimmer/edger. Some people still prefer automatic feeding. Basically, this is the best option for those who want the convenience of using a cordless trimmer without worrying about running out of power. That’s largely due to the powerful battery plus the availability of the low setting. What if you want to buy your own battery instead? Then you can buy the 5.0Ah battery BL1850B and enjoy 60 minutes of usage for this excellent cordless trimmer. The motor can provide a speed of up to 7800 rpm. The telescoping shaft can be adjusted to go from 48.5 inches to 56.5 inches. When you’re trimming in tight spaces, you have 5 available pivoting head positions to adjust the cutting angle. The head can rotate up to 180 degrees, so it can become an edger. The cutting width is 10.25 inches. With the battery, it still weighs just 6.4 pounds. The loop handle is adjustable. The power is awesome compared to the rpm settings you can get with other cordless models. It can convert to an edger easily enough. It’ can be adjusted so that you can be comfy while using it. Part of the comfort is also due to the light weight. It’s also easy to control even in tight places. You’ll have to buy the battery separately. It doesn’t have automatic spool feeds. With this you get to decide what kind of battery you want to use. However, you should get the Makita LXT lithium-ion battery for optimal results. 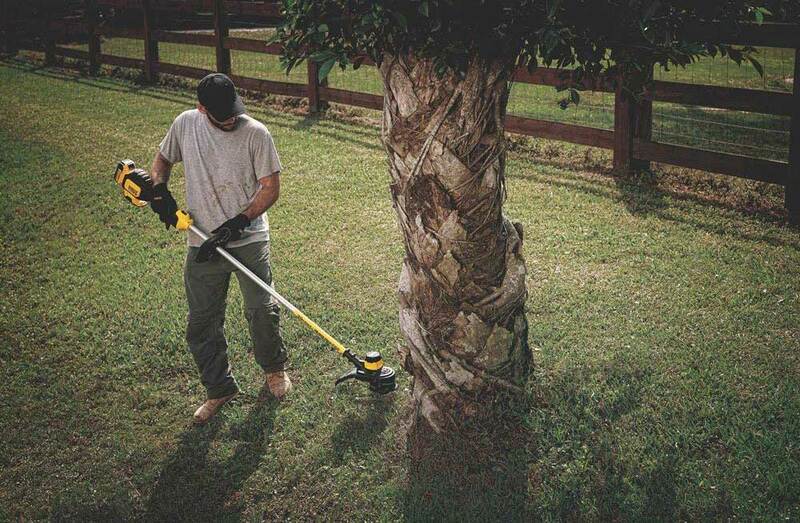 This is the cordless trimmer you need when lower rpm settings can’t deal with the stalks and vines on your property. So which one is the best? With our list we stuck to famous brands to make sure they all work very well and they won’t break down easily. The most obvious answer to that question is simple: it’s up to you. You need to address your primary concerns. So if you’re just trimming grass and you don’t want to make a fuss, then you’re probably looking at the cordless models that don’t make a lot of noise. Yet if you really want to get the job done right, you should really consider the Husqvarna 128LD. This thing is a beast. Yes, it’s a lot noisier and heavier than your battery-operated options. 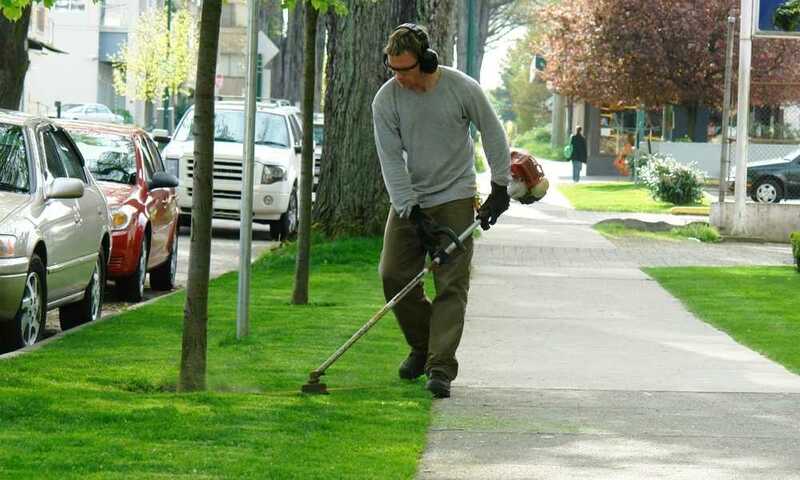 You’ll need to buy an attachment to use it as an edger, while ear protection is a must. Yes, you need to deal with the need for gas mixed with oil, and the resulting fumes as you use it. But this is still without a doubt your best option, as it offers you contractor-grade performance that can deal with any type of vegetation on your lawn that you want to trim and cut. At the same time, you’re not faced with an intimidating set of features that’s common for other professional weed wackers. This one is extremely easy to use even for ordinary homeowners. So buy this Husqvarna 128LD if you have a sizable lawn and tough stalks to deal with. You won’t have any trouble cutting the yard and you’ll get the job done more quickly. That’ll give you more time to relax in a lounge chair while you look out and admire your beautiful yard.